On my way to the studio this morning I stopped off at Lake Union Park in Seattle to do a small study of the view across to University District. It was cool to watch the seaplanes landing in front of me while I worked. Although I am very partial to depictions of aircraft in art, I managed to show some restraint and keep them off the canvas. The conditions were variable, so I started by laying in the pattern of blues in the sky and the darks of the distant shoreline. I added the buildings and shoreline detail when the sun was shining. As usual the clouds represent a kind of average, I stole bits from each cloud as it passed. 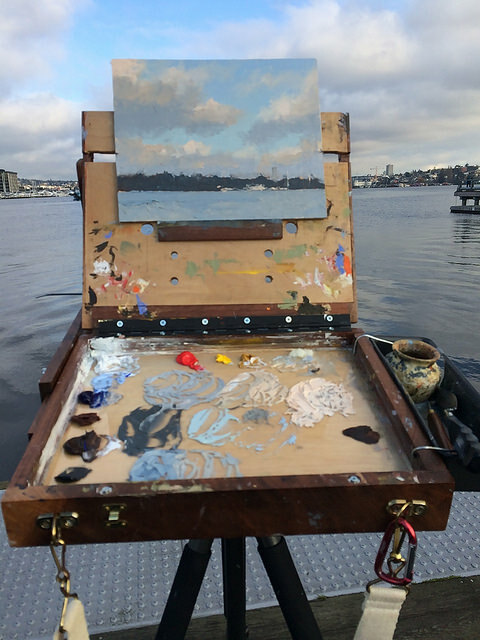 The palette I used this morning was a little different from others I've used when painting on the water in Seattle: ultramarine, radiant blue, burnt umber, yellow ochre and a tiny bit of red. The choice of burnt umber enabled me to mix grays very quickly. A wise decision, it turned out, because I was freezing. Here's a photo of everything nicely lined up. The painting's still being worked on at this point.